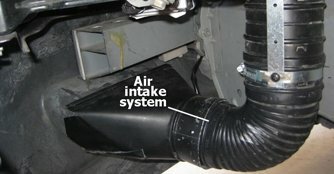 There are a handful of car owners out there that are not quite sure what an air intake system does, how it works or how important it is to a car. In the 1980s, the first air intake systems were offered and consisted of moulded plastic intake tubes and a cone-shaped cotton gauze air filter. A decade later, overseas manufacturers began importing popular Japanese air intake system designs for the sport compact market. Now, with the technological advancement and ingenious engineering minds, intake systems are available in metal tube designs, allowing a greater degree of customisation. The tubes are typically powder-coated or painted to match a vehicle. Now that modern engines are not equipped with carburettors, it's the fuel-injected engines we are concerned about. So the question is - what exactly do we need to know about it? The function of the air intake system is to allow air to reach your car engine. Oxygen in the air is one of the necessary ingredients for the engine combustion process. A good air intake system allows for clean and continuous airflow into the engine, thereby achieving more power and better mileage for your car. A modern car air intake system has three main parts - the air filter, mass flow sensor and throttle body. Located directly behind the front grille, the air intake system draws air through a long plastic tube going into the air filter housing, which will be mixed with the car fuel. Only then will the air be sent to the intake manifold that supplies the fuel/air mixture to the engine cylinders. An air filter is an important part of a car's intake system, because it is through the air filter that the engine 'breathes'. It is usually a plastic or metal box in which the air filter sits. An engine requires an exact mixture of fuel and air in order to run, and all of the air enters the system first through the air filter. The air filter's job is to filter out dirt and other foreign particles in the air, preventing them from entering the system and possibly damaging the engine. The air filter is usually located in the air stream to your throttle valve assembly and intake manifold. It is found in a compartment in an air duct to the throttle valve assembly under the hood of your car. Read more about air filters. 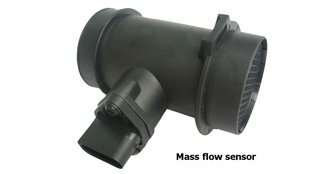 A mass air flow sensor is used to find out the mass of air entering a fuel-injected internal combustion engine. From mass flow sensor, then, does it goes to the throttle body. There are two common types of mass airflow sensors in use on automotive engines. They are the vane meter and the hot wire. The vane type has a flap that is pushed by the incoming air. The more air coming in, the more the flap is pushed backed. There is also a second vane behind the main one that fits into a closed camber that dampens the movement of the vane giving a more accurate measurement. The hot wire uses a series of wires strung in the air stream. The electrical resistance of the wire increases as the wire's temperature increases, which limits electrical current flowing through the circuit. When air flows past the wire, it cools, decreasing its resistance, which in turn allows more current to flow through the circuit. However, as more current flows, the wire's temperature increases until the resistance reaches equilibrium again. A cold air intake is used to bring cooler air into a car's engine, to increase engine power and efficiency. The most efficient intake systems utilise an air box which is sized to complement the engine and will extend the power band of the engine. The intake snorkel, or the opening for the intake air to enter the system, must be large enough to ensure sufficient air is available to the engine under all conditions from idle to full throttle. Cold air intakes operate on the principle of increasing the amount of oxygen available for combustion with fuel. Because cooler air has a higher density (greater mass per unit volume), cold air intakes generally work by introducing cooler air from outside the hot engine bay. 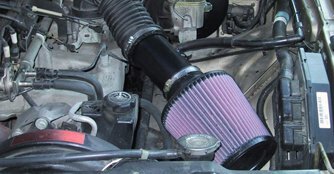 The most basic cold air intake replaces the stock air box with a short metal or plastic tube leading to a conical air filter, called a short ram air intake. The power gained by this method can vary depending on how restrictive the factory air box is. Well-designed intakes use heat shields to isolate the air filter from the rest of the engine compartment, providing cooler air from the front or side of the engine bay. Some systems called "fender mount" move the filter into the fender wall, this system draws air up through the fender wall which provides even more isolation and still cooler air. The throttle body is the part of the air intake system that controls the amount of air flowing into an engine's combustion chamber. 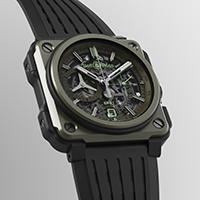 It consists of a bored housing that contains a throttle plate that rotates on a shaft. When the accelerator is depressed, the throttle plate opens and allows air into the engine. When the accelerator is released, the throttle plate closes and effectively chokes-off air flow into the combustion chamber. This process effectively controls the rate of combustion and ultimately the speed of the vehicle. 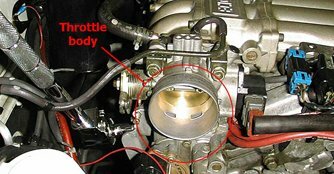 The throttle body is usually located between the air filter box and the intake manifold, and it is usually located near the mass airflow sensor. Some of the advantages of having a cold air intake include an increase in horsepower and torque. As a cold air intake draws in a higher volume of air which may be much cooler, your engine can breathe easier than with a limiting stock system. With your combustion chamber filled by cooler, oxygen-rich air, fuel burns at a more efficient mixture. You get more power and torque out of every drop of fuel when it's combined with the right amount of air. Another advantage to having a cold air intake is improved throttle response and fuel economy in most cases. Stock intakes often deliver warmer, fuel-rich combustion mixtures that cause your engine to lose power and responsiveness while running hotter and more sluggishly. Cold air intakes can help your fuel economy by improving your air to fuel ratio. Looking for parts to improve your car's performance? Check out our Marketplace! *This article was updated on 17th April 2018. Browse the 198 Power Enhancement merchants in our motor directory. Looking for SU carburettor with manifold..
Carburetor (or Carburettor if UK) servicing, what a difference!